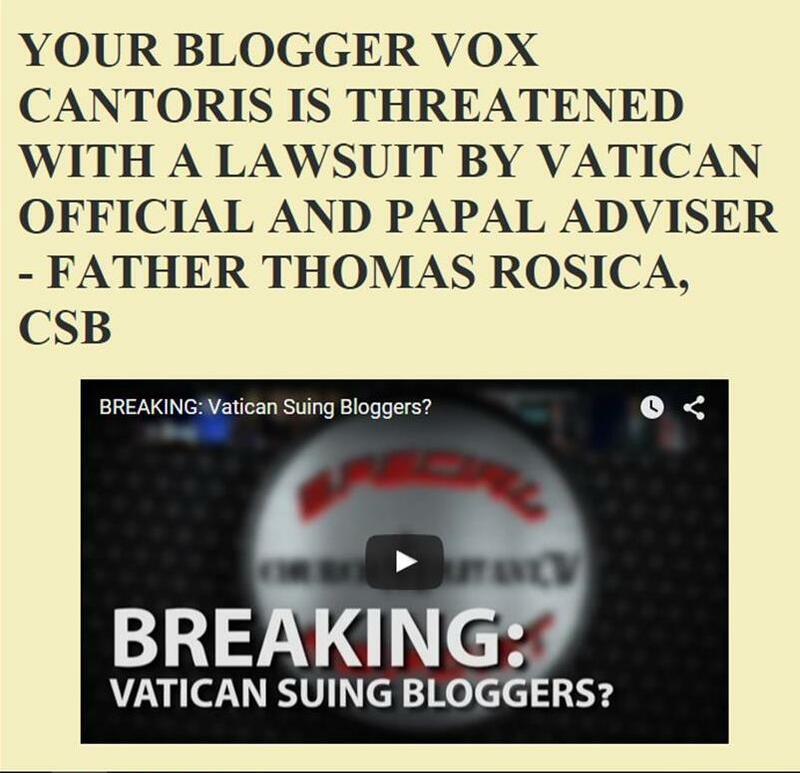 Vox Cantoris: Cardinal Brandmüller: Defenders of a Second Union are "excommunicated"
Has Cardinal Brandmüller just thrown down the gauntlet at Bergoglio? Does he have bodyguards and a food taster? Bergoglio will not answer the dubia. If he answers one way, he would need to renounce his program of error and uphold magisterial teaching. If the other, he convicts himself of heresy and would cease to be Pope. The logic then, is that Bergoglio is already in heresy, it is only that it has not been formally proclaimed by those empowered to do so - cardinals and bishops in an "imperfect Council." Following logically then, whether an imperfect Council takes place or not to declare the formal declaration of heresy - that is one thing, the reality of the fact is quite another, that Bergoglio is in heresy. Then the real tough question must be asked, "If Bergoglio is in heresy, is he still Pope?" 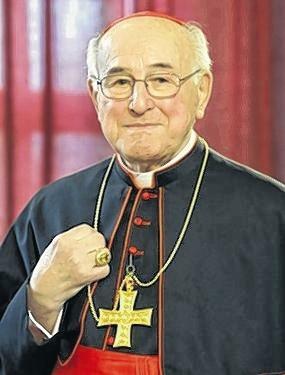 "Anyone who says a new union can begin while a legally married partner is still alive is excommunicated, because this is an heresy," Cardinal Walter Brandmüller, 88, told the German daily Frankfurter Allgemeine Zeitung (October 28). Brandmüller explains: "The fact that marriage is a sacrament and therefore indissoluble is a dogma." It points out that no adulterer can receive Holy Communion. The Cardinal can not understand the fact that Francesco does not respond to the Dubia about the Amoris Laetitia. He asks: "Can something be good today, if it was a sin yesterday?" Also: "Are there still actions that are always morally condemnable in every circumstance, such as murder or adultery?" Brandmüller is concerned about a "schism" in the Church. In three or so sentences this courageous Cardinal has certainly challenged Bergoglio and all his sycophantic minions! Compared to the endless writings and pages of prose from those who KNOW the man is a heretic, this short, sharp and to the point denunciation of Francis et al. is utterly refreshing! May Almighty God, through his Holy Archangel, St Michael, protect this dear Cardinal Brandmuller from any attempts on his life and may God, The Most Holy Paraclete cover him with His Wisdom throughout all his days! God Bless Cardinal Brandmüller, We hear you loud and clear! "If Bergoglio is in heresy, is he still Pope?" 3. Canon 188.4 (1917 Code of Canon Law) teachers that : If a cleric (pope, bishop, etc.) becomes a heretic, he loses his office without any declaration by operation of law. 6. Now the fifth true opinion, is that a Pope who is a manifest heretic, ceases in himself to be Pope and head, just as he ceases in himself to be a Christian and member of the body of the Church: whereby, he can be judged and punished by the Church. This is the opinion of all the ancient Fathers, who teach that manifest heretics soon lose all jurisdiction…. The foundation of this opinion is that a manifest heretic, is in no way a member of the Church; that is, neither in spirit nor in body, or by internal union nor external…. (Pope Pius XII, Encyclical Mystici Corporis, nn. 22-23). That's enough to make the point. An heretic cannot become, or remain Pope. So speaks the One, Holy, Catholic, Apostolic Church of Jesus Christ!!! Sorry! Repeated two quotes in comment, then put comment in two posts. Getting geriatric. Start of Altzheimer's? "Brandmüller is concerned about a "schism" in the Church." I would respectfully suggest that the CC has been in a festering schism since VII. Nothing but rescinding that Council will suffice. If PF is deemed by our theologians, canonists, etc. not to be a heretic after all his blasphemies, overturning scripture, bashing the Deposit of Faith, falsifying the Magisterium to suit his NWO agenda & completely ignoring Tradition & the writings of previous popes going back to the First Apostles, then more restraints must be in future attached to the word 'infallibility". ++Brandmuller did not refer to the fraternal formal correction having been made or the chance of an imperfect council being called. He cannot, surely, be still waiting for an answer to the Dubia? ++Burke said Truth is greater than numbers, & the numbers of Catholics now calling for clarification of AL from PF is noticeably growing, so why are we still waiting for PF to do his duty in confirming the Brethren in the True Faith? Each day brings more rupture to the Bride of Christ & the souls being lost will have to be accounted to God for by these unfaithful men of the cloth.